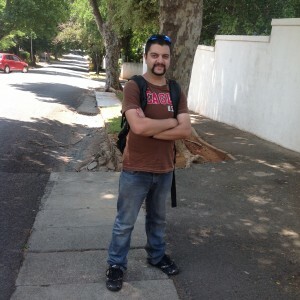 Meet Danyle Nunes, the new intern of ER24. With his long-held ambition to work as a paramedic edging closer to fruition, Danyle briefly allows himself to think ahead, something he rarely does. More comfortable in the present, Danyle is better known as the chairman of the SCF (the Sector Crime Forum) and as the eyes and ears of Melville. He is also the guy who visits or calls every crime victim in the suburb with a view to helping them through it. I’ve been on nodding terms with Danyle for the past eight years that he has worked part-time at a bottle store in Main Road. Of modest stature, his silent presence, frequently under a cap and behind dark sunglasses, belies the person who walks the length and breadth of Melville. When we got together to chat for this story, I realised I had many misconceptions about Danyle – I thought he was shy, quiet, and walked because he couldn’t drive. In fact, he has a ready sense of humour, needs little encouragement to talk and chooses to walk our streets to keep tabs on the suburb he has always called home. He was brought up by his single-parent mom, never knew his dad (and never felt a need to do so) and has a brother seven years his senior with whom he get’s on “half-well, as he’s my half-brother”. As for his first name, he’s used to the questions about the spelling and pronunciation, which is Daniel. “My mother was still on pain-killing drugs following my birth,” he explains, tongue firmly in cheek. Danyle’s now a family man after getting together earlier this year with his partner Nicole, and her young son Jourdain. He says the ease of “becoming a parent”surprised him. I ask him whether this responsibility makes him more cautious on his SCF patrols or if the adrenalin rush overrides it. He corrects this misconception too. “It’s not so much the adrenalin rush that gets me,” he says thoughtfully. “(The whole of) Melville’s kind of my home and I want to protect my house.” As for Nicole, she is utterly supportive. “As long as I come home safely, she won’t kill me,” he says, once again revealing that dry sense of humour. And he’s quick to give credit where it’s due – to the security officers on the streets, and the police, who work together with the SCF to keep crime at bay. Now that won’t surprise me. Thank you for publishing this article, Suzanne. It makes me so proud to know that Danyle’s efforts are being recognised, as he has so much love and compassion for his community.